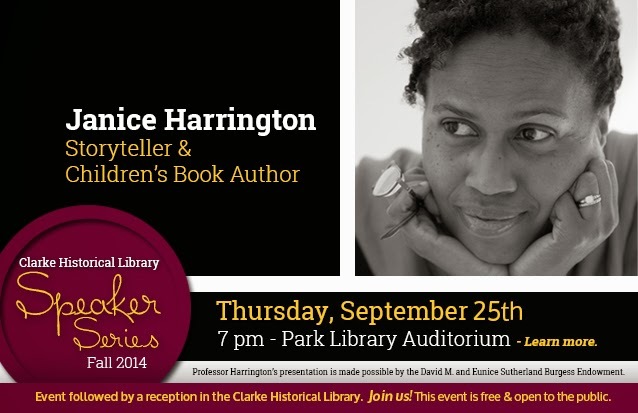 Professor Janice Harrington, storyteller, poet, and author of children’s books will speak this Thursday, September 25, at 7:00 p.m. in the Park Library Auditorium on the subject of children’s books and her own work. Janice Harrington’s first children’s book, Going North, was published in 2004. The book won several awards and drew upon her memories of rural Lamar County, Alabama. The Chicken Chasing Queen of Lamar County, published in 2007, was one of Time magazine’s top ten children’s books of the year. Her 2008 book, Roberto Walks Home, continues the stories of Ezra Jack Keats, a now deceased white writer who was among the first to publish stories using African American and other children of color as central characters. Currently a member of the faculty at the University of Illinois Urbana-Champaign, she was for seventeen years the head of children’s services at the Champaign Public Library. She has performed as a professional storyteller in a variety of settings, including the National Storytelling Festival in Washington, DC. The presentation is free and open to the public. A reception will follow to talk in the Clarke Historical Library. Professor Harrington’s presentation is made possible by the David M. and Eunice Sutherland Burgess Endowment.